Don’t think you are alone here. If you need help, you only need to ask. If you want some support on a project you always wanted to do, just look around you. You are at a university where people work together to ensure we all achieve our ambitions. Students, teachers and staff - it doesn't matter who you are - we are here to help each other. 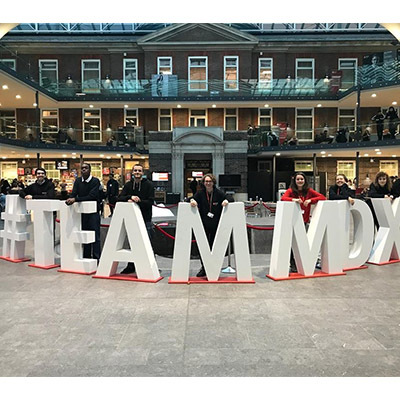 To illustrate these stories of support and collaboration, the university is launching an initiative: #TeamMDX. 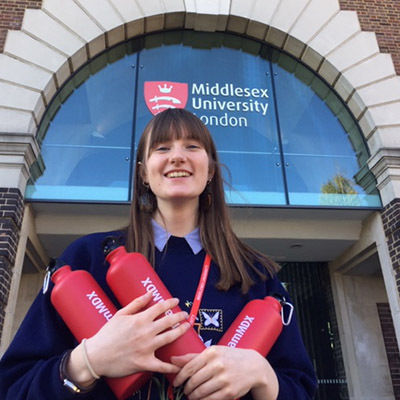 I'm here to tell you why it's so important we all begin using #TeamMDX to share our stories and ensure that everyone feels part of our community here at Middlesex. “Since beginning my studies here, I have been involved in so many things. I have always felt part of a community. I find it so easy to connect with like-minded people here - people are so down to earth. If you show you need more help and you enjoy what you are doing you will always find a way at MDX because people are always willing to help - and that's what #TeamMDX is all about. If you want to try something new at middlesex there is always a way”. The possibilities are countless. And I will use myself as an example. I came to this country three years ago to work but ended up at MDX studying creative writing and journalism. I always dreamt of writing professionally but in my country there are no courses available. Since beginning my studies here, I have been given so much support - and my tutors and peers have always believed in me, even when I didn't. I'm so proud to belong to #TeamMDX. If you are an entrepreneur and you have your own project, Middlesex offers you all you need. Jake Smith, creative writing student, is currently working on his own music-themed radio program using Middlesex installations and material. He told me, “it was really easy to get an induction on the radio station and we continue to get amazing support staff across the University.” Jake said. Each year hundreds of students from around the world choose this campus for their Erasmus year. Ignacio Otero is a Spanish student in exchange this year. About his experience at Middlesex he said, “I fell in love with the campus since the beginning. I adapted quickly, the classes are less theoretical and I have more chances to improve because they are all about practice. There are less students per class than in Spanish universities so professors have also got more time for you". The idea of unity and togetherness is not only relevant to us students. Lecturers such as Maja Simunjak share the same vision. “I enjoy very much working with my journalism students. I like to think we work in a constructive and intellectually stimulating environment, which is at the same time relaxed and friendly. I love seeing them thrive and learn new skills, but what I really also appreciate is them asking questions when something isn’t clear and asking for support when they need it. I think this stems from the relationship of respect and trust we’ve developed, and I think this is a good type of relationship between teachers and students. Having a few laughs in class also helps!”. Got your own story of collaboration, support or just an example of unity? Why not share it on social media using #TeamMDX.